PHIX has a unique design that will satisfy all your nicotine cravings and wow your senses. The PHIX was released mid-2016 and have prided themselves on helping smokers make the switch to PHIX and finding a healthier lifestyle. With the PHIX Pods, there is a wide variety of flavor that allows their customers to find the perfect flavor for whatever mood they may be in. All their flavors are created from the award-winning brand and flavors from Brewell MFG. The nicotine formulation in the PHIX pods has the perfect ratio to overachieve your expectations of a closed system device. The mission of the PHIX by MLV is to give adult smokers a healthier alternative to smoking and help the countless number of smokers on the planet make the switch. The PHIX was created with four things in mind: form factor, convenience, flavors, and sensations. 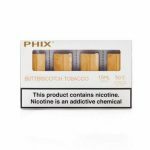 PHIX Butterscotch brings you the delightfully sweet taste of butterscotch mixed atop a tobacco base that will have your taste buds watering all day long. This flavor has just the right amount of sweetness that will drive your sweet tooth crazy! As you inhale PHIX Butterscotch, the taste of succulent butterscotch will wash across your taste buds in the most scrumptious way. As you exhale, the tobacco flavor combines with the butterscotch, the sweetness bringing out the most mouthwatering flavors of the tobacco that you’ll ever taste. PHIX Ice is the perfect flavor for those of you who smoked menthol cigarettes are still getting those menthol tobacco cravings. This flavor has just the right amount of menthol and tobacco to have your taste buds in a frenzy from your first puff until your last. As you inhale PHIX Ice, the menthol flavor that you know, and love will hit your taste buds in the most delectable way. As you exhale, the menthol flavor combines with the tobacco base to recreate the taste of your favorite cigarettes! 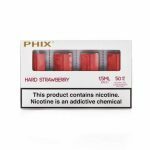 PHIX Hard Strawberry is a combination of sweet strawberries with an edge. This flavor is perfect for those of you who love the taste of strawberries, but other pod system flavors are too sweet. As you inhale PHIX Hard Strawberry, the taste of freshly picked strawberries will dance across your taste buds in the most sensual way. This flavor is so accurate that your jaw will be on the floor with every puff you take. As you exhale, the edge-y strawberry flavor takes over to drive your taste buds crazy. PHIX Spearmint is a fusion of sweet mint and menthol that will have your taste buds going crazy with just one puff. This pod flavor will certainly have you falling head over hills from your first puff until your last. 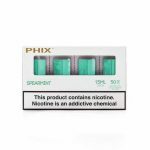 As you inhale PHIX Spearmint the salivating inducing taste of spearmint will wash over your taste buds in the most delightful way. As you exhale, the menthol base will have you feeling as if you’re breathing ice. This minty flavor is so out of this world that you will feel as if you’re on a different plane of flavor with every puff you take. The PHIX Pods have a few different choices for you to choose from to fit whatever mood you may be in that day. With these pods you will never have to worry about going flavor blind as they have so much flavor packed into them you might stagger back a bit with each inhale you take. Each pod has 1.5ml of e-liquid and a ceramic wick that will have you tasting nothing but the mouthwatering, life-changing flavors they create. Also, with the PHIX it has temperature control tech that will leave every puff you take tasting, cool and enjoyable.